(Sammy Jo Hester | For The Washington Post) Ashlee and Levi Smith play with their sons Liam, 3, and Aiden, 3 months, on Sunday in Salem, Utah. The family has relied on the government-backed Children's Health Insurance Program. West Jordan • The lingering uncertainty in Congress over the fate of the Children's Health Insurance Program has left Ashlee and Levi Smith torn between optimism and anxiety. As the parents of two young children who have relied on the government-backed health care plan, the Smiths are unsure whether they should stretch their finances to put their boys, 3 and 3 months, on a private plan — or have faith that a polarized Congress will work it out. "$1,200 for the four of us," Ashlee Smith, 26, said, estimating the plan's monthly cost from their two-bedroom town house outside Salt Lake City, where she crafts necklaces as part of the family business. "We can't pay that and save for a mortgage, or save anything at all." Congress could decide this week to reauthorize the Children's Health Insurance Program, or CHIP, which has become a crucial element in broader negotiations over how to fund the government. If no decision comes by Friday, then lawmakers are likely to take up the issue in early January — but with each delay, the pressure grows on families to find their own solutions. For the Smiths, who are Republicans, the congressional stalemate over the $15.6 billion program is bigger than a question how to pay. It is also a question of who — or what — to believe. Over the course of the year, their faith in the GOP-led Congress has eroded. Their general disenchantment became more pronounced when lawmakers, including even their home-state senator, Orrin Hatch, an architect of the CHIP program, failed to secure the funding. The tangible effects of that inaction reverberated from the Smiths' home to doctors' offices and to statehouses across the country. Nine million children use CHIP to help lower their medical costs. The Smiths have watched their GOP representatives in Washington focus on pushing politically difficult initiatives — from seeking to rescind the Affordable Care Act to enacting a sweeping tax overhaul. CHIP is considerably more popular and, unlike many programs, enjoys bipartisan support. On television, the Smiths watched Alabama Sen.-elect Doug Jones use his nationally televised victory speech to demand funding for the program. Governors from red and blue states have pleaded with Congress, and television host Jimmy Kimmel delivered a monologue extolling the program's value. Everyone seems for it, and lawmakers insist they can get something done. Still, nothing. "Jesus, bless them," said Smith, holding Aiden in her hands and thinking of her lawmakers. "I am not being very nice to my government, and I have faith that one day there will be good leaders who can put all the fighting aside. But they've put themselves in such a corner that none of them can work together even when they agree." CHIP was the product of more a congenial Washington. After the failure of President Bill Clinton's health care overhaul effort in the early 1990s, the liberal Sen. Edward Kennedy, D-Mass., paired with Hatch, a conservative, to do something to reduce the number of uninsured children. The idea was to fund it through settlements and taxes from the tobacco industry. In 1997, the federal government began giving block grants to states, who in turn crafted insurance plans for working-class parents. According to a study by the Kaiser Family Foundation, the program helped reduce the rate of uninsured children from 14 percent to 7 percent. Both liberals and conservatives got something from the plan. For Democrats, there was an opportunity to show how government can help more for people who can't afford medical care for their children. For Republicans, they got a chance to show how innovative states could be in creating their own programs. In Utah, the federal government disbursed more than $118 million in 2016 to offer insurance plans for the parents who made too much money to qualify for Medicaid and too little to afford insurance on the federal government exchanges — that's about $48,000 for a family of four. More than 16,000 children in Utah currently use the program. Since the program began, states have never faced a lapse in funding, and advocates hoped that Congress would reauthorize money this year as a matter of routine. It didn't. In November, the House passed a bill that would reauthorize funding for the program if the money could be found from new sources, including taking funds that were used to support health centers in underserved communities. Senate Democrats and some Republicans rejected the House plan, arguing that it would preserve one safety net by destroying another. Federal funding for CHIP stopped flowing on Sept. 30. A report put out by the Kaiser Family Foundation published on Wednesday noted that states are running out of money faster than anticipated. Half will have no money for the program by January's end if nothing is done. Nearly 2 million children would lose insurance, according to the Georgetown Health Policy Institute. Some families in Utah have said they will have to take on second or third jobs to help pay for private insurance, while others said they would stop working altogether to lower their income and qualify for government assistance. Hatch told The Washington Post he remained confident that CHIP will be funded before states run out of money. "Washington is clearly broken, and the dysfunction we've seen this year has been the worst in recent memory," said Hatch, who is the chairman of the Senate Finance Committee. Nonetheless, Hatch said predicted CHIP reauthorization "will pass the Senate in a fiscally responsible manner in the coming weeks — with enough time to ensure the program has no gaps in coverage — and continue to provide quality coverage for children across the country." If Hatch can't keep this pledge, there is no consensus yet on what to do when the money runs out. Fifty states will have to conjure 50 different plans. Many, like Utah, say the costs of the program are too high to pay for it alone. Officials in Alabama this week said they could accept no new children for their CHIP program. Oregon has tapped into reserve funds. Some states, such as Colorado and Virginia, have told parents to search for private insurance options. 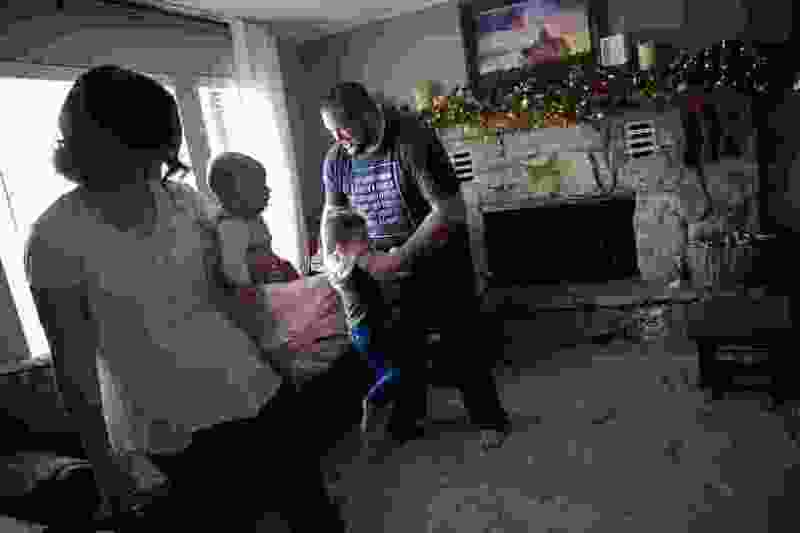 In Utah, there is a daily discussion about whether parents should do the same, according to Kolbi Young, a spokeswoman for the state's health department. The state has prepared for the worst, drafting letters to parents explaining the situation in the event Congress fails to act. "We're a Republican-leaning state with a Republican government, so we're optimistic," Young said. "But it's tricky. We want our families to be prepared, but we don't want them leaving the program if they don't need to." In the meantime, parents wait and fret. 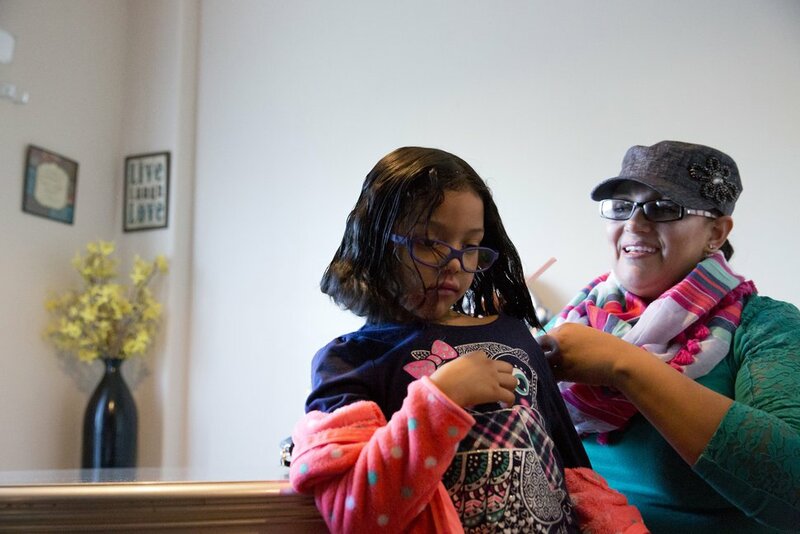 (Sammy Jo Hester | For The Washington Post) Monica Porras gets her daughter, Deane Ortiz, 6, ready to attend a fundraiser on Dec. 8 in West Jordan, Utah. Porras, 45, is the mother of seven children, two of whom are autistic, and operates cleaning businesses. CHIP helped pay for treatment for her children. Monica Porras, 45, who owns a small domestic and commercial cleaning business, said she has been grateful for CHIP becuase it allowed her to afford treatments for her 15-year-old son Abraham, diagnosed with autism. "If there's no CHIP, he'll be in regression," she said. "There must be a misconception of who we are, that we are not hardworking, that we are not deserving," Porras said. The Smiths don't know how they would make ends meet if CHIP goes away. To supplement income from Ashlee Smith's necklaces, Levi Smith just took a customer service job that he hopes will lead him down the path to become a software developer. The parents are currently uninsured, but in January will receive coverage through a plan on the federal government's marketplace established by the Affordable Care Act, commonly referred to as Obamacare. Recently, as the Smiths discussed what to do about providing for the children if they get sick, they tried to make sense of these political times. Levi Smith said he learned to love the Affordable Care Act, President Barack Obama's health care law, because having low insurance costs helped him see a specialist after developing gout. He liked the idea of the Republicans' tax cut legislation, at least if it meant that filling out tax forms would become simpler. "I'm all for making life easier," Levi said. Ashlee Smith saw it differently. "They're not seeing the most vulnerable," she said. "They're seeing tax breaks for the rich when they could be taking care of doing better care. We're not the ones who are going to benefit." Added Levi: "I believe that there are good people on both sides, but they just have different ways of doing good things. I just wish common sense would compromise. Without that compromise, I feel like we are taking something away from people, and it's not their fault. When you do that, I don't think you can talk about the American dream in the same way." There was space for disagreement, Ashlee said, but she still questioned just how things in Washington could have gotten so bad. With a background in child development, she volunteers at a local hospital to help parents and children with terminal illnesses cope. Many of them could only pay with CHIP. "I'm still not sure that I believe in socialized medicine, but I think this is different," she said, holding her baby in her hands. "I wish there could be something I could do to help, but I feel like I'm just a small fish in this." The Washington Post's Paige Cunningham contributed to this report.